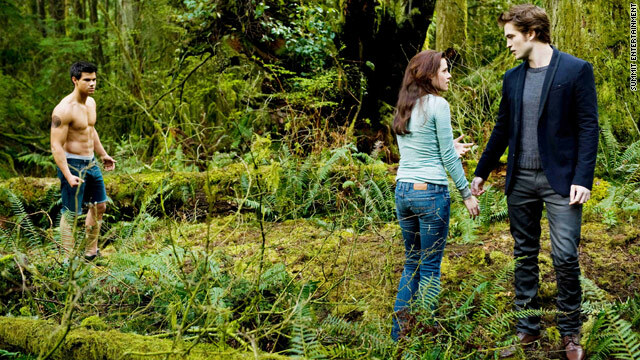 "New Moon," starring Taylor Lautner, left, Kristen Stewart and Robert Pattinson, is the No. 1 film in the country. Illinois woman taped sister's birthday at theater showing "Twilight Saga: New Moon"
(CNN) -- A birthday celebration that culminated in a trip to catch the blockbuster movie "The Twilight Saga: New Moon" could land 22-year-old Samantha Tumpach in prison for three years. The Chicago, Illinois-area woman captured three minutes of the film on her videocamera while taping part of her sister's surprise party at a Muvico theater in Rosemont. Theater managers contacted police, who arrested Tumpach. She spent two days in jail. Now she faces a felony charge of illegally copying a movie. "The motion picture industry has encouraged theater owners to adopt a 'zero-tolerance' policy prohibiting the video or audio recording of any portion of a movie," Muvico Entertainment, which oversees the theater, told HLN's "Prime News." Attempts to reach Tumpach and any representation were unsuccessful. Piracy has been an ongoing issue for the motion picture industry. The Motion Picture Association of America estimates that illegal piracy costs its business billions of dollars every year. Muvico said the group believes that hidden cameras in theaters are the direct source of more than 90 percent of all pirated movies. Still, CNN legal analyst Lisa Bloom said three years appears excessive for the incident, if it should be prosecuted at all. Illinois state law is fairly broad on this subject, she said, and she believes that "it's a ridiculous distortion of the law to prosecute this young woman, who recorded only a few minutes of the film as part of a birthday video." Experts say the MPAA, and by extension Summit Entertainment, which produced "New Moon," walks a fine line with cases like this. Kelli Gillespie, an entertainment reporter for the CW, says the movie industry is trying to avoid a similar situation to what the music industry faced with illegal downloads and is trying to work with "ever-changing technology that's available to so many consumers without alienating their fan base." What happens now? Muvico Entertainment says it's up to local police to determine Tumpach's future. However, the MPAA or Summit Entertainment may want to step in to assist a fan, Gillespie says. It's in their best interest, she said, "to figure out a way where you aren't punishing the consumer."